A new year is a great time to reconsider your airline loyalty. However, deciding which program makes the most sense for you can be a difficult decision given the variations between the programs when it comes to complimentary upgrades, bonus points or miles and other valuable perks. Today, I’m continuing my revision of last year’s series that considers just how valuable each program’s elite status is mathematically. As in previous iterations, I’ll evaluate the major perks provided at each tier and try to peg a specific value to each. After starting with the American Airlines AAdvantage program, I’ll now move onto Delta and its SkyMiles program. As I noted in my first post, this series is not meant to replace or detract from the airline elite status analysis I completed in fall 2017. That analysis looked not only at the value of the various perks offered to elite members but also the importance of those perks to travelers. In addition, it didn’t go into details for the individual airlines, instead offering a comparison across the major airlines here in the US. Today’s analysis (and the entries that follow) will do just that. Before we get to the details of the elite status tiers of the SkyMiles program, a couple of disclaimers. First, it’s important to note that these mathematical analyses represent just one way of calculating the value you’d get out of a given elite status level. Everyone has his or her own way of valuing the various benefits of loyalty programs; some may always pay for first and business class and thus have no need for complimentary upgrades, while others may travel exclusively in the US and don’t care about free lounge access on international itineraries. As a result, feel free to adjust the numbers I use to make it more relevant to your own personal valuation. You earn 20% more Medallion Qualification Miles (MQMs) than the minimum required for the given status level. You spend an average of 12.5 cents per MQM. Two final bits of information: For the sake of this analysis, I’m valuing any bonus miles earned based on TPG’s most recent valuations, which peg SkyMiles at 1.2 cents apiece. In addition, I’m rounding all of the individual benefit valuations to the nearest $5 to make the math a bit simpler. Silver Medallion travelers can enjoy Comfort+ seats, but only within 24 hours of departure. The lowest tier in Delta’s program is Silver Medallion status, which normally requires 25,000 MQMs or 30 Medallion-qualifying segments plus $3,000 Medallion-Qualfying Dollars (MQDs). For this analysis, I’ll base my numbers on earning 30,000 MQMs at a cost of 12.5 cents per mile (so a total spend of $3,750). Unlimited complimentary first-class upgrades ($250): The first and (arguably) most valuable benefit of Silver Medallion is the ability to upgrade to first class on domestic flights plus flights from the US to Canada, the Caribbean and Central America. This was even extended to award tickets in October 2016. Unfortunately, these won’t start clearing until 24 hours before departure (or day of departure for US flights with Delta One), and you’ll fall below all other Delta elites (including their companions), so don’t expect these upgrades to clear with any regularity, especially if you frequently travel during popular times for business travelers. I’ll assume a relatively conservative valuation of $250. 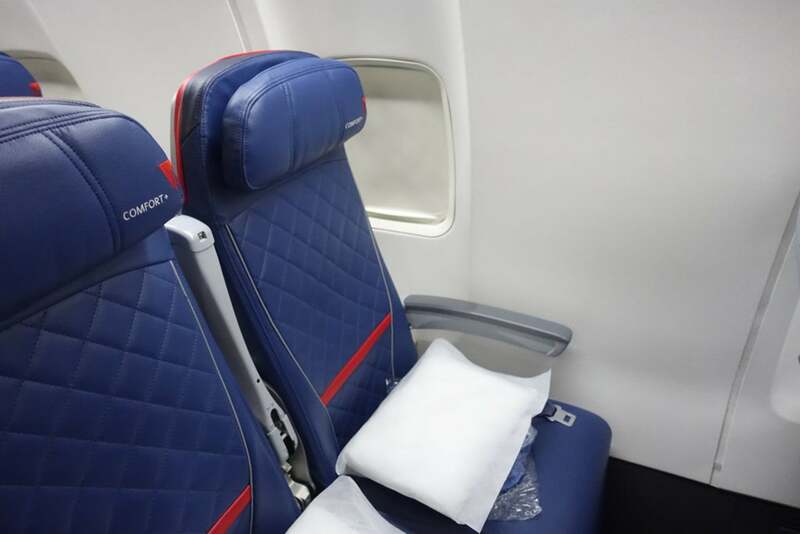 Unlimited complimentary Comfort+ upgrades ($100): A couple of years ago, Delta updated its process for domestic and international Comfort+ access, as all Medallion members must now request an upgrade to these seats. To make this even worse, Silver Medallion members are only eligible to clear into Comfort+ 24 hours prior to departure, at which point most of the seats will likely be taken by higher-tier elites. Obviously the true value of this perk depends on how frequently you score a Comfort+ seat and the premium the seats command on your flight, but I’ll peg this perk at $100. Preferred seats ($50): While you cross your fingers and hope for your upgrade to first class and Comfort+ to clear, you can at least select preferred seats for free as a Silver Medallion member. Delta describes these as “choice Main Cabin seats” but are typically just window and aisle seats just behind the Comfort+ cabin, though they may include exit rows on certain aircraft. As a result, I’ll peg this perk at just $50. Mileage bonus ($90): Silver Medallion members earn 7 miles per dollar spent, 2 more than regular members. With $3,750 MQDs, that equates to 7,500 extra miles, worth $90 based on TPG’s most recent valuations. Waived baggage fee ($125): As a Silver Medallion flyer, you’ll enjoy a free checked bag over the standard allowance on most Delta-operated flights, saving $60 per round-trip domestic flight and up to $200 on flights to Europe. This free checked bag within the US can weigh up to 70 pounds, and the benefit extends to eight travel companions in the same reservation. In addition, if you carry a Delta American Express card (like the Gold Delta SkyMiles® Credit Card from American Express), you can actually get a second free bag of up to 70 pounds when traveling within or between the US and Canada. This perk can easily add up if you regularly check a ton of gear, but I’ll peg it at $125. Priority check-in and boarding ($50): Silver Medallions are eligible for priority check-in and can be among the first Main Cabin passengers to board, but the latter of these is the same offered to Delta American Express cardholders, so neither perk is very valuable. Priority phone line ($50): A priority phone line can be a lifesaver during large-scale weather events (or power outages or system issues), but it’s definitely not the most valuable perk. Partner perks ($50): Silver Medallion travelers are designated as SkyTeam Elite members when traveling on a SkyTeam airline, which includes priority check-in, boarding and standby plus preferred seating “subject to availability.” You’ll also enjoy additional perks on select partners like AeroMexico, GOL and Virgin Australia (check out this link for full details). These can come in handy if you frequently travel on one or more of these partner airlines but probably isn’t worth much to the average traveler. Hertz benefits ($10): Silver Medallion members can earn additional bonus miles when renting with Hertz (800 more than a regular member, to be exact). While you may have other car rental companies you use, I’ll assume that you utilize this perk once per year. As a Gold Medallion, you’ll be able to access the Sky Club (or other partner lounges) when traveling internationally thanks to your SkyTeam Elite Plus status. The second tier in Delta’s program is Gold Medallion status, which normally requires 50,000 MQMs or 60 Medallion-qualifying segments plus $6,000 MQDs. For this analysis, I’ll base my numbers on earning 60,000 MQMs at a cost of 12.5 cents per mile (so a total spend of $7,500). Unlimited complimentary first-class upgrades ($650): Gold Medallion flyers are also eligible for complimentary first-class upgrades on domestic flights and short-haul international flights, and these will start clearing 3 days before departure. Given that you’re prioritized above SIlver Medallions and the additional flying, I’ll bump the value to $650. Unlimited complimentary Comfort+ upgrades ($250): You’re also eligible for upgrades to Comfort+ as a Gold Medallion traveler, and these will start clearing 3 days before your flight. I’ll more than double the value from Silver Medallion due to the additional flying and higher likelihood of your upgrades clearing. Preferred Seats ($100): Same benefit, more frequent utilization. Mileage bonus ($270): As a Gold Medallion traveler, you’ll earn 8 miles per dollar spent, 3 more than non-status flyers. With $7,500 MQDs, that equates to 22,500 extra miles, worth $270 based on TPG’s most recent valuations. Waived baggage fee ($250): Gold Medallion members enjoy a slightly higher baggage allowance than Silver travelers, as they’re allowed to bring two bags weighing up to 70 pounds on flights within the US and Canada. Waived same-day confirmed and standby fees ($225): While Silver Medallions and non-status flyers need to pay $75 to standby for or switch to an earlier flight on the day of departure, these fees are waived for Gold Medallions. I’ll assume a utilization of three times per year for this benefit. Priority check-in, security, boarding and baggage delivery ($225): You’ll enjoy additional perks at the airport as a Gold Medallion, including priority security and baggage delivery. Priority phone line ($100): Same benefit, more frequent utilization, though Gold agents will likely be more knowledgeable than Silver ones. Partner perks ($150): When you travel on SkyTeam member airlines as a Gold Medallion, you’ll be designated as SkyTeam Elite Plus, granting you a host of added perks like priority security, baggage handling and immigration. As noted above, a handful of partners extend this even further, so be sure to check out this link for more information. I’ll peg these perks at $150, though if you frequently utilize partner airlines, it could be much more valuable. Hertz benefits ($15): Gold Medallion members will enjoy the same opportunity to earn bonus miles with Hertz as Silver travelers, but you’ll also be granted complimentary Five Star Status in the Hertz Gold Plus Rewards program. I’ll stick with my once-per-year assumption from above but add an additional $5 for the status. Your first-class upgrades will hopefully clear 5 days before departure, as I found on one of my daughter’s first flights to New York back in 2015. The third tier in the SkyMiles program is Platinum Medallion status, which normally requires 75,000 MQMs or 100 Medallion-qualifying segments plus $9,000 MQDs. For this analysis, I’ll base my numbers on earning 90,000 MQMs at a cost of 12.5 cents per mile (so a total spend of $11,250). Unlimited complimentary first-class upgrades ($1,100): Platinum Medallion flyers enjoy the same first-class upgrade perks as Silver and Gold travelers, though you’re prioritized above both of those levels and will start clearing 5 days before departure. As a result, I’ll bump this value to $1,100. Unlimited complimentary Comfort+ upgrades ($400): You’ll also be eligible for complimentary upgrades to Comfort+ as a Platinum Medallion flyer, and these will start clearing shortly after ticketing (assuming upgrade inventory is available). Preferred Seats ($100): Since Platinums will likely clear into Comfort+ or first class, I’ll keep the same valuation I used for Golds. Mileage bonus ($540): Platinum Medallion members earn 9 miles per dollar spent, 4 more than non-status flyers. With $11,250 MQDs, that equates to 45,000 extra miles, worth $540 based on TPG’s most recent valuations. Waived baggage fee ($325): Your baggage allowance as a Platinum Medallion traveler is slightly higher than what’s offered to Gold Medallions, as you can check up to three bags weighing 70 pounds apiece on flights within the US and Canada (though I doubt many will take full advantage of this perk). Given the additional travel, I’ll bump this benefit to $325. Waived same-day confirmed and standby fees ($300): Platinum Medallions enjoy the same fee waivers as Gold Medallions for same-day confirmed and standby, so I’ll assume that you utilize this four times a year given the additional travel. Waived award redeposit/reissue fees ($150): One of my favorite benefits from my time as a Platinum Medallion was the ability to change or cancel an award ticket with no fee. This saved me $150 every time I modified a redemption, and I’ll assume that you utilize this once per year. Just remember that this waiver does not apply to Basic Economy award tickets. Priority check-in, security, boarding and baggage delivery ($325): Same benefit, more frequent utilization. Choice Benefits ($200): When you qualify for Platinum Medallion, you get to select a Choice Benefit. These include four Regional Upgrade Certificates (RPUs), 20,000 bonus SkyMiles and the ability to gift Silver Medallion to a friend or family member (among others). While you can get some outsized value, especially with the RPUs, I’ll peg this selection at a conservative $200. Partner perks ($250): Platinum Medallion members have the same SkyTeam Elite Plus designation as Gold Medallions, but they’ll also enjoy a couple of added perks, including access to Virgin Atlantic lounges outside the United States when traveling on Delta or Virgin Atlantic. As a result, I’ll bump this perk slightly to $250. Hertz benefits ($25): Platinum Medallion members enjoy 250 more SkyMiles per Hertz rental than Silver and Gold Medallions, and you’ll also receive automatic President’s Circle status in the Gold Plus Rewards program. As a result, I’ll boost the value of this perk to $25. Diamond Medallion members can select Global Upgrade Certificates as a Choice Benefit, valid on any Delta-operated flight. The final tier in the SkyMiles program is Diamond Medallion status, which normally requires 125,000 MQMs or 140 Medallion-qualifying segments plus $15,000 MQDs. For this analysis, I’ll base my numbers on earning 150,000 MQMs at a cost of 12.5 cents per mile (so a total spend of $18,750). Unlimited complimentary first-class upgrades ($1,800): Diamond Medallions enjoy the highest upgrade priority and will start clearing 5 days in advance (but ahead of Platinum Medallion travelers). As a result, I’ll bump this perk to $1,500. Unlimited complimentary Comfort+ upgrades ($650): This priority also extends to Comfort+ seats, as you’re eligible for upgrades shortly after ticketing. I’ll boost this to $600. Mileage bonus ($1,350): Platinum Medallion members earn 11 miles per dollar spent, 6 more than non-status flyers. With $18,750 MQDs, you’ll take home 112,500 extra miles, worth $1,350 based on TPG’s most recent valuations. Waived baggage fee ($450): Same benefit, more frequent utilization. Waived same-day confirmed and standby fees ($450): Same benefit, more frequent utilization. Waived award redeposit/reissue fees ($300): Same benefit, utilized twice per year. Complimentary CLEAR membership ($50): Back in 2016, Delta began offering complimentary CLEAR memberships to Diamond Medallion members, a program that continues to expand. However, since it’s still available at a relatively limited number of airports (around 40 as of publish time), I’ll peg this at roughly half of the discounted $99 annual fee offered to all SkyMiles members. Priority check-in, security, boarding and baggage delivery ($500): Same benefit, more frequent utilization. Priority phone line ($350): By many reports, Delta Diamond line agents are frequently able to help top-tier elites with an array of requests, from forcing availability after a missed connection to waiving fees that should be applied. As a result, I’ll boost this significantly over the valuation I gave to the similar perk for Platinum members. Delta Sky Club membership ($450): For years, basic Sky Club membership was included gratis for Diamond Medallions. In 2019, you’ll need to use one of your Choice Benefits to get complimentary individual Sky Club membership, but Delta added an extra Choice Benefit for Diamonds to offset that. Delta charges $545 annually for this membership, and it has been adding clubs, bolstering food options and improving its Wi-Fi speeds of late. You may still be better off securing Sky Club membership by holding The Platinum Card® from American Express ($550 annual fee) (See Rates & Fees) or the Delta Reserve® Credit Card from American Express ($450 annual fee) (See Rates & Fees), thereby enabling you to choose a different Choice Benefit. If you wish to upgrade to an Executive Sky Club membership (which enables you to bring in two guests per visit), Diamonds can burn a second Choice Benefit to do so. Since you can effectively “purchase” a membership with the $450 Delta Reserve card, that’s how I’ll value this perk. Additional Choice Benefits ($1,800): Assuming you select the individual Sky Club membership, you’ll still have additional Choice Benefits to choose. For starters, reaching Diamond doesn’t mean you skip the Choice Benefit selection as a Platinum. You can still select the perks mentioned above when you reach the qualification threshold for Platinum en route to Diamond, thus giving you $200 of value. If you select Sky Club membership as your first Diamond Choice Benefit, you’ll then have another two. Full details are available at this link, but these benefits include Global Upgrade Certificates, additional Regional Upgrade Certificates, 25,000 bonus miles or a gift of Gold Medallion status to a friend/family member. It’s virtually impossible to peg a value to this (due to the flexibility inherent in a selection of “choice” benefits), but I’ll assume you pick the 4 Global Upgrade Certificates ($300 apiece, as upgrade inventory has been tightening as of late) and gifted Gold status ($400). Adding in the $200 value from reaching Platinum and you get a total of $1,800. Partner perks ($400): Same benefit, more frequent utilization. Hertz benefits ($35): Same benefit, more frequent utilization. If you don’t currently have status, expect quite a bit of travel in economy before the perks start to kick-in. I then created an Excel spreadsheet that uses these numbers to calculate how much value you’d get from the different levels of United elite status given a certain amount of flying. All you need to do is change the number in cell A2 to represent the number of MQMs you expect to fly in 2019, and the spreadsheet will update with the corresponding value. For example, you’ll see that I have pre-loaded 60,000 MQMs. At this rate, you’d get no benefits from the first 25,000 MQMs, then enjoy Silver Medallion benefits for the next 25,000 MQMs (at a rate of 2.58 cents per MQM), and then enjoy Gold Medallion benefits for the final 10,000 MQMs (at a rate of 3.73 cents per MQM). This means that if you’re starting from scratch and estimate that you’ll earn 60,000 MQMs in 2019, you’d be able to get $1,018.33 worth of perks from the Delta SkyMiles program. Only you can decide if pursuing Delta elite status in 2018 is right for you. Photo courtesy of BRENDAN SMIALOWSKI/AFP/Getty Images. How much will you travel in the future? If you earned Delta elite status in 2018, it’s valid through January 31, 2020, and if you qualify in 2019, your status will last until January 31, 2021. It’s critical to think about how much you’ll be traveling in the future. If you push hard to earn Diamond Medallion, for example, the valuable perks outlined above only apply when you actually travel. How well does Delta’s route map match your typical travel patterns? Pursuing elite status with an airline that you can’t feasibly fly on a regular basis is a fool’s errand. Be sure to consider Delta’s service from your home airport(s) and how easy it is to get to your desired destination. How sensitive are you to price and convenience? There are many trade-offs in this hobby, and one of the most common is deciding whether to use your preferred airline or hotel chain when it’s not the most convenient or cheapest. Would you book a one-stop Delta flight if Southwest had a cheaper nonstop option? If the answer is no, it may not be worth going out of your way to earn Delta elite status (or any elite status, for that matter). Could you enjoy elite-like perks with a credit card? The final consideration involves travel rewards credit cards. Many airline cobranded cards offer perks to cardholders than can mirror what you’d enjoy as an elite member. For example, the Gold Delta SkyMiles Credit Card from American Express includes a free checked bag, priority boarding and a 20% in-flight discount, while the Delta Reserve® Credit Card from American Express provides complimentary Sky Club access in addition to waived checked bag fees, preferred boarding and the in-flight discount. A couple of these cards even offer bonus miles or even bonus MQMs for reaching certain spending thresholds, helping boost your account or assisting you in qualifying for Delta status without flying. If you can pay a flat annual fee for one of these cards and gain access to perks that matter to you without going out of your way to earn elite status, that may be a good plan. These questions are also not easy to answer, as there are many different factors that come into play with each of them. Nevertheless, it’s a worthwhile exercise to evaluate your own situation as you determine if Delta elite status is for you! Earning airline elite status carries an array of perks that can make your entire travel experience more comfortable. However, not all levels with all carriers are created equally, so it’s critical to analyze which elite status program best lines up with your typical travel patterns and what you value most as a traveler. If you’re considering switching your loyalty in 2019, I hope this detailed look at the Delta SkyMiles elite status program has helped your decision!